The Soviet defense ministry had the tendency of changing requirements during development of new weapon systems. For some years, they would maintain a particular requirement and then change it. Several times this meant that capable weapon systems were scrapped or their production was curtailed as they couldn’t satisfy the official requirements. One such change in the requirement meant that the Soviet navy now wanted big ASW cruisers instead of ASuW (Anti-Surface Warfare) cruisers. Thus the production of the original Kresta class was curtailed to just 4 vessels and its follow on Kresta II was developed as ASW cruiser, ten of which served the Soviet navy. The requirements were changed again in the early 70s and the Soviet navy now wanted a class of surface warfare cruisers. This requirement gave rise to the Slava class cruiser, one of the most heavily armed surface vessels ever commissioned. The Soviet navy always lagged behind its primary adversary, ie the US navy. The Americans had an impressive fleet led by aircraft carries. The carriers allowed them to project power far away from their bases. A carrier battle group can be used for sea denial while its aircraft can hit naval as well as land based targets. Carriers have been used to enforce blockades which don’t allow friendly forces to reinforce those trapped behind it. Such a blockade could mean massive losses on the ground and at sea. The Soviets thus wanted to build surface warfare vessels which could lead a flotilla to destroy a carrier battle group. Admiral Yumashev, last of the 10 Kresta IIs built for the Soviet navy. A popular opinion claims that the Slava was built as a backup to the Kirovs, which is totally plausible. 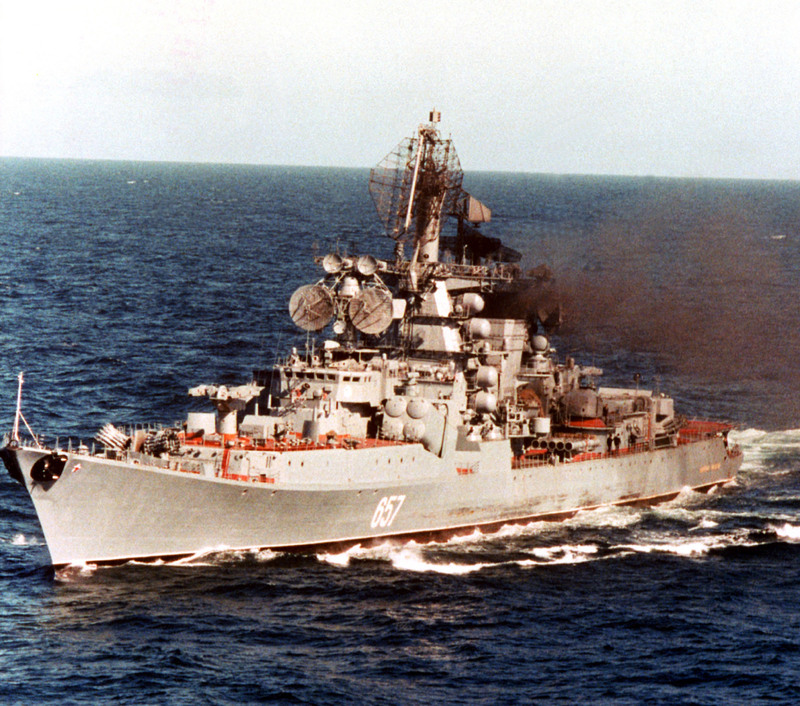 Kirov class cruisers were the largest and the most heavily armed surface combatants designed during the cold war. Their design made them innovative and costly to build and operate. We know that the Soviets broke their own policy of not building large single purpose vessels and building a backup for Kirov sounds like the perfect reason for the same. The Soviets were building the Kresta II and Kara for taking care of the western submarine fleet but the surface warfare component of the Soviet navy was aging. Thus in the year 1972, work began on a heavy surface warfare combatant which would be built as a follow on to the Kara class cruisers. The Kresta II and Kara were built at the Nikolaev Shipyard which lies on the present day Ukraine’s Black sea coast. To keep production costs down, it was decided that this new vessel would be based on the hull of Kara class. A Kara class cruiser displaced around 9000 tonnes whereas the new vessel was supposed to be much larger thanks to the massive batteries of 16 P-500 Bazalt heavy AShMs, 64 S300F missiles and associated guidance and tracking equipment. Azov, one of the few Kara class cruisers built for the Soviet navy. The P-500 is a descendant of the much older P-35 anti-ship missile which was based on the P-6, the first Soviet AShM. The P-35 sported advanced data links which relayed video back to Soviet assets in the region. It also had the capability P-700 is well known for. In multi-missile salvos, only one missile lit up its radar whereas the rest simply followed it in and lit up their radars much later. We need to remember that the P-35 is a 1960s vintage and still had such advanced features. The P-500 was developed from the P-350 which is an enhanced variant of the P-35. It could strike targets 550km away from its launch platform at speeds well over Mach 2 with a 1000kg warhead. It could also carry a single 350kt nuclear warhead to make sure that the enemy vessels never sailed again. 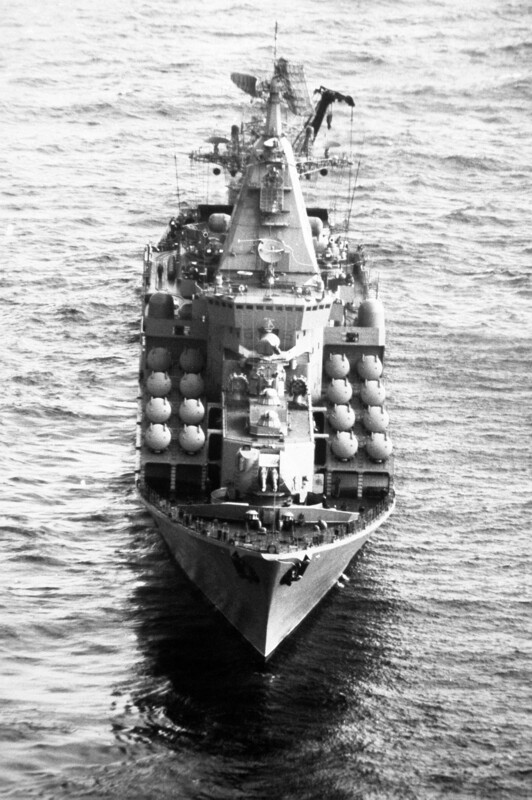 The missile was mounted on Kiev class aircraft carrying cruisers and was chosen for the Slava after the missile entered service in mid 1970s. The massive battery of 16 P-500 missiles thus gave Slava carrier killing capability. All 3 vessels of the Slava class, Varyag, Marshal Ustinov and Moskva have received the updated P-1000 which has a heavier launch weight, new electronics and a better engine. The speed and range of the P-1000 is same as the P-500. In this pic of Varyag, the caps of the P-1000 silos are seen in open position. We can see how big the missiles are compared to the sailors standing below them. 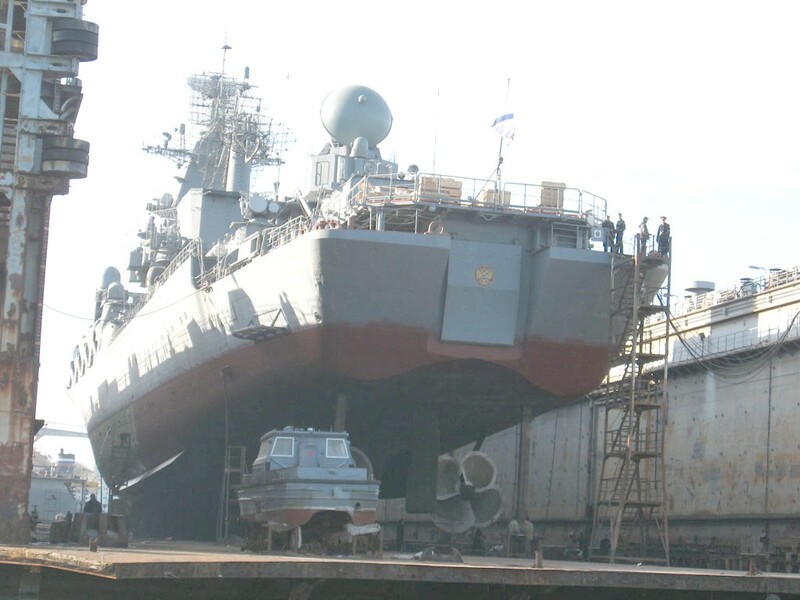 In this pic Varyag has just launched one of its 16 massive AShMs. Among other weapons, Slava also sports 64 S300F missiles for air defense. These missiles are placed behind the smoke stacks in 8 rotary cells which house 8 missiles each. It can be used to secure a flotilla of friendly naval assets, or cover a chunk of land close to the sea. This capability is being used as we speak to secure the Russian base in Latakia, Syria. The development of the S300F was started along side the S300PMU in the year 1969. They both used the variants of the same missile ie 5V55RM in the case of S300F which can engage targets between 9km and 100km. The system can use Top Steer, Top Pair, Top Plate radars for target acquisition whereas Top Dome provides targeting information to the missile enroute to the target. It can guide 2 missiles at 3 individual targets simultaneously by switching between the missiles. The S300F battery onboard the Marshal Ustinov. We can see the Top Dome director on the right of this pic. 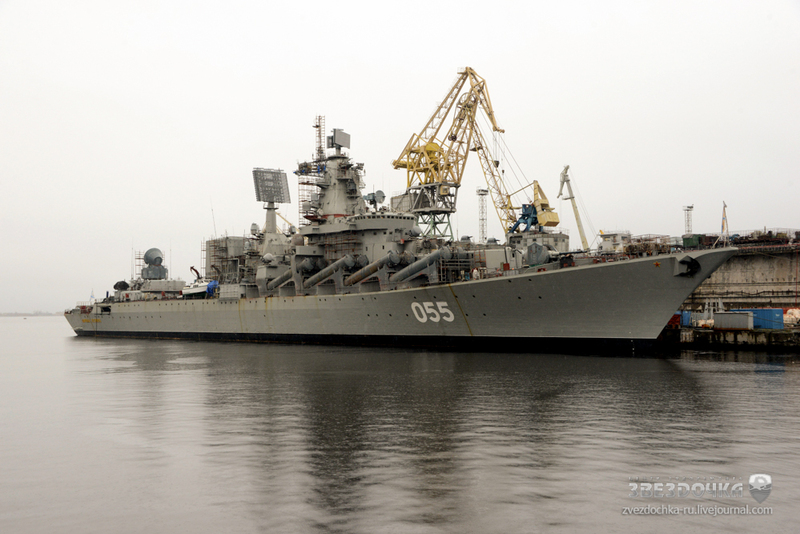 Slava class cruisers Moskva and Marshal Ustinov sport Top Steer radar on the front mast and Top Pair on the rear one. The third vessel Varyag sports Top Plate in place of the Top Steer radar. Pictures of the 4th vessel Ukraine suggest she also has Top Plate and Top Pair radars. Thus the Slava shares its primary air defense system with the Kirov class. Marshal Ustinov is undergoing a big refit which has replaced the Top Steer with Top Plate radar while the Top Pair was replaced by Podberozovik L-Band radar (which we will call as Flat Screen throughout the article) . The other two vessels, Moskva and Varyag will undergo the same refit after Marshal Ustinov is delivered to the Russian Navy. The vessel also has 2 pop-up Osa SR-SAM launchers on either side of the helicopter hangar while 6 Ak-630 (2 infront of the RBU-6000 and 4 beside the secondary radar mast) provide the final line of defense against aircraft and missiles. Marshal Ustinov with Top Plate on the front mast and Flat Screen on the 2nd mast. The Slava can also be used to track and destroy enemy submarines. It sports a towed array sonar which can be deployed from the stern door along with a fixed array in the bow. Towed array is an essential sensor for any ASW vessel. The array has hydrophones embedded at the rear end. Since these hydrophones are away from the vessel, even the faintest sounds can be heard and classified. This capability makes is a big difference during combat as enemy submarines can be detected before they can do any damage to friendly assets in the region. 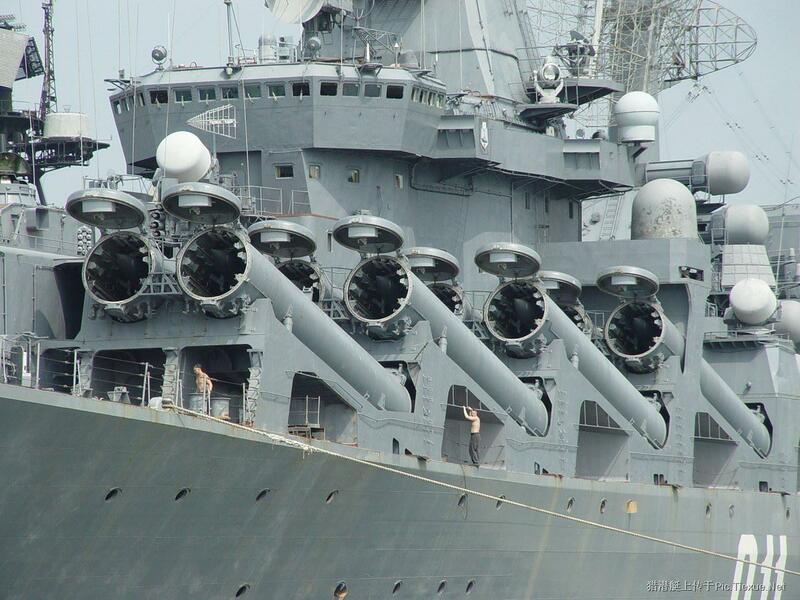 Slava carries 2 quintuple 533mm launchers housed internally. She can also support a single helicopter. Additionally, 2 RBU-6000 ASW rocket launchers are positioned between the P-500 batteries in front of the bridge. These rockets the last line of defense against torpedoes and enemy submarines. Instead of deploying 2 Ak-130 single barrel guns, Slava sports a single dual barrel Akk-130 gun on the bow. The guns can be used for shore bombardment, attacking smaller vessels etc. Moskva’s 16 P-500, 2 Ak-630, dual barrel Ak-130 and 2 RBU-6000 are clearly seen in this pic. Almost all modern Soviet vessels sported similar stern doors to deploy towed arrays. The preceding Kresta class was powered by problematic steam propulsion. By the time Slavas were developed, gas turbines became a lucrative option for powering surface ships. She is powered by 2 M70 10,000 SHP gas turbines for cruising whereas 4 M8KF boost turbines producing 27,500 SHP each used to undertake high speed operations. She also has boilers which use the exhaust from these turbines for supplying steam to steam turbines. The gas turbines power 2 shafts which drive 2 propellers beneath the stern. The powerplant allows the Slava to sail at speeds over 33kn with ease. 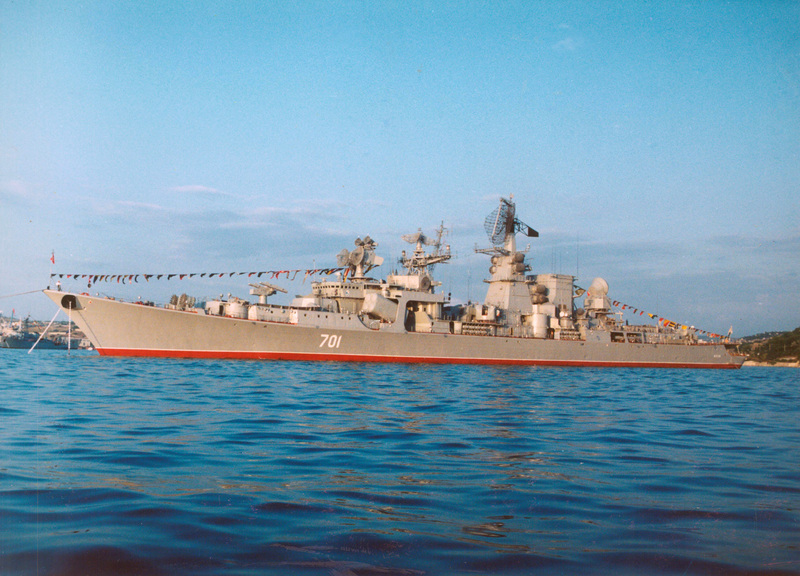 The Soviet Union had planned to build as many as 20 Slava class cruisers. 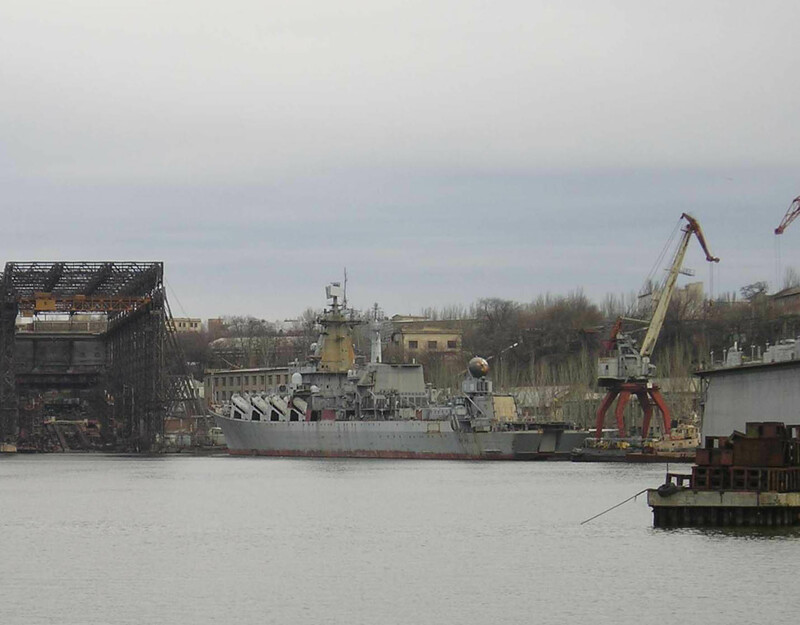 They only missed the massive target by 16 cruisers, as they could commission just 3 while the 4th lies in derelict condition at the Nikolaev shipyard in Ukraine. The first vessel of the class was named Slava and was laid down in 1976, launched 3 years later and commissioned 4 years after it. She was renamed as Moskva after the collapse of Soviet Union and has been deployed to provide air cover to the Russian base in Latakia, Syria. The second vessel entered service as the Marshal Ustinov in the year 1986 followed by the third in 1989, which was named Red Ukraine. The name was changed to Varyag after the collapse of the Soviet Union. The 4th vessel is presently called Ukraine and is around 70% complete. The construction was suspended due to the Soviet collapse and the plans to complete it have been cancelled due to the conflict in eastern Ukraine. As stated before, Ukraine also sports Top Plate on the front mast and Top Pair on the rear one. Luckily for the Slavas, the cost of operating them wasn’t as high as the Kirovs and thus all 3 of them are in active service. Even though only 1 was deployed in the years after the collapse, all 3 were maintained in active condition. Again to their luck, the plan to refurbish all of them has a higher chance of fruition compared to one related to the Kirovs as the costs are much lower in this case. Lets hope they find a way to complete the 4th vessel and commission it but one thing is for sure, we will be seeing the other 3 in active service for some time to come. Epsilon, would you know which Slava sports hull number 121? Thanks,needed it for my model, would you happen to know if Moskva sports differences with her sisters? Lemme give your model project a shot in the arm. Use chrome to translate this page and use the images. 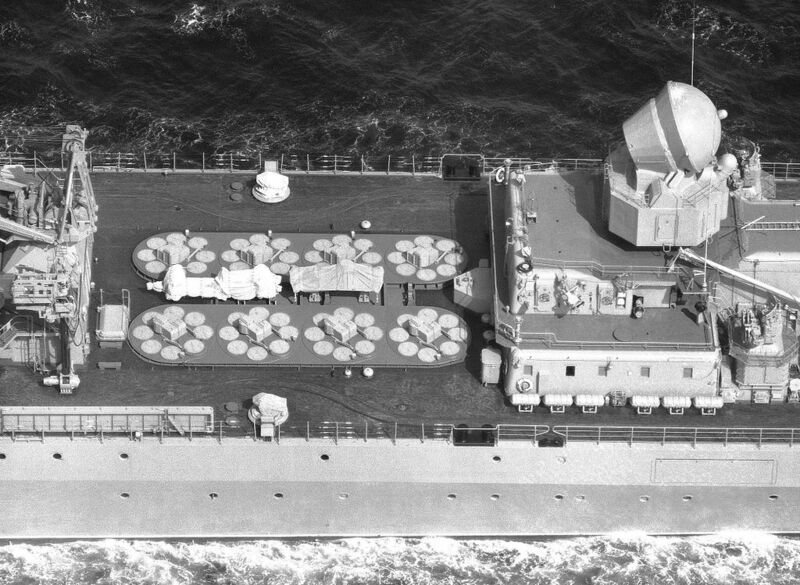 It is a very very nice archive of pictures of Soviet ships.